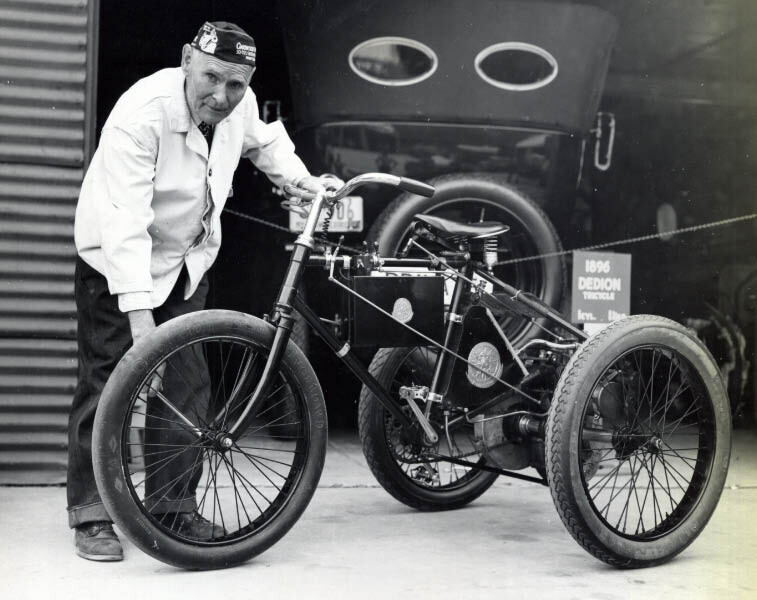 Joe Tracy and a rare 1896 De Dion-Bouton tricycle. In 1955, at the age of 82 years, Tracy sent this letter, the below postcard and an invoice. 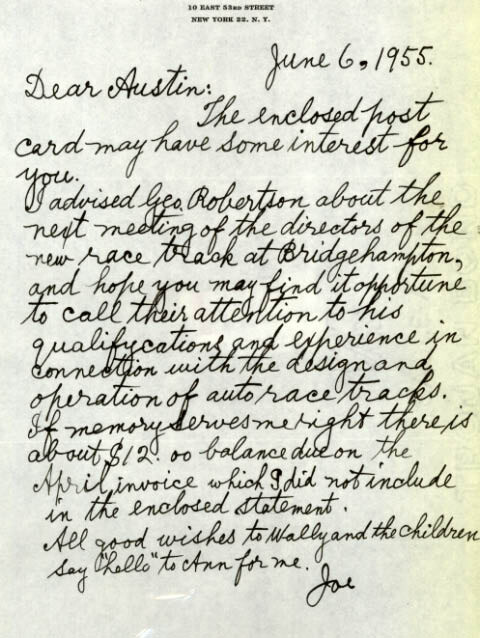 He also suggested that Clark invite George Robertson to assist in the design of the Bridgehampton race track. Joe Tracy makes an appearance at the 3:32 mark. Courtesy of Walter McCarthy. 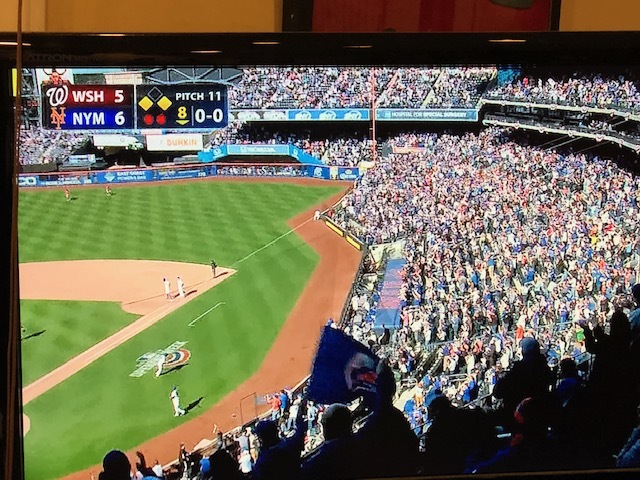 Great Met game today kept my flag waving! 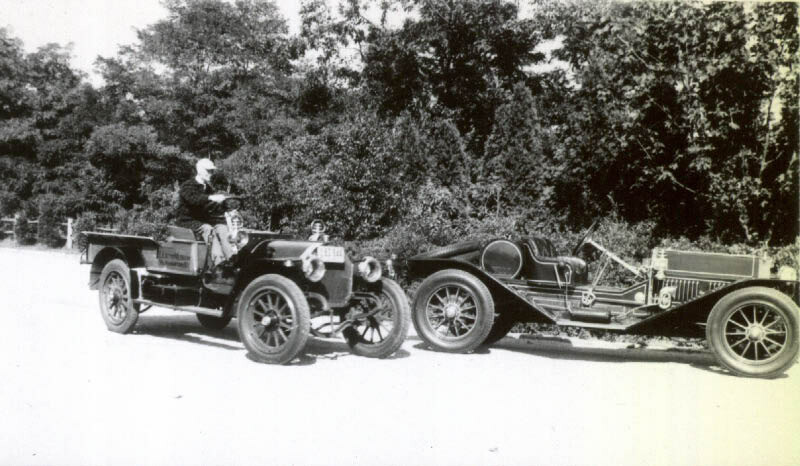 Never tire of seeing pics/video or hearing stories related to Austie and the L. I. Museum….Thank You for posting. About that last picture….Look out Mets, those reformatted and pesky Twins are coming to town next week! Jeff, they will be facing DeGroom and Thor! Thanks for those great Joe Tracy photos. Also, thanks to Wally McCarthy. By the way, I knew you were a Mets fan. Some game yesterday! S. Berliner III, Yes, that trike is awesome…. Awesome trike indeed and very interesting! This French? company may have produced various models. This trike compared to the one on Sam’s site (not the custom Vanderbilt version) has no foot pegs on the fork, the tires slightly smaller, and chain ring on the pedals slightly larger. Both front brake mechanisms appear the same, compressing the top of the tire under the head tube, but can’t make out the rear brake for beans. Too much stuff going on back there. 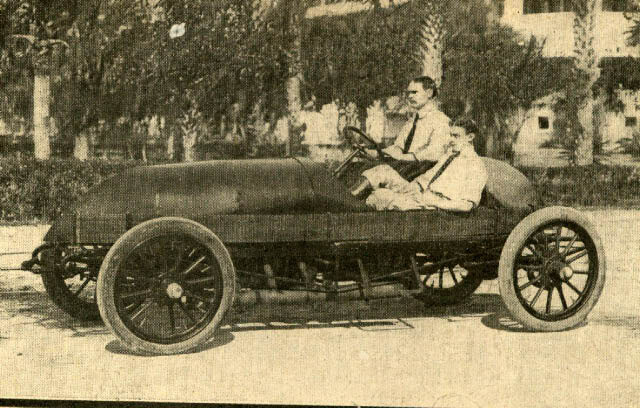 The Vanderbilt version appears to possess a leather Brooks saddle, but never seen one with that suspension gadget underneath. Only the best! Thanks everyone for posting.